Satisfied with his sustainable reintegration and peace building efforts in the Niger Delta region, the organizing committee of the 60th edition of the popular Odi Ogori Ba Uge International Festival has concluded plans to confer a peace award on the Special Adviser to the President on Niger Delta/Coordinator of the Presidential Amnesty Programme, Brigadier General Paul Boroh (Rtd) at the grand finale of the festival this Saturday at Odi in Kolokuma/Opokuma Local Government Area of Bayelsa State. Chairman, organizing committee of this year’s edition of Odi Ogori Ba Uge, Prince Iwefa Aganaba who gave reasons for the conferment of the Niger Delta Peace Ambassador Award on Gen. Boroh, said before this time, Niger Deltans were generally tagged as militants and with all sort of ill vices because of the agitations that culminated in militancy in the past, noting out the narrative has now changed with the peace building initiatives of Gen. Boroh, whose pragmatic reintegration efforts have brought peace and stability in the region. “The Special Adviser to the President on Niger Delta/Coordinator of the Presidential Amnesty Programme, Gen. Paul Boroh (Rtd) is the Peace Ambassador of the 60th Edition of Odi Ogori Ba Uge. We did not just give him that position, it is to tell the world that he has done well and we are solidly behind him, it is to tell the world that the Presidential Amnesty Programme, which he is coordinating is making so much impact in our region and we are in full support of it. “The Amnesty programme is a physical representation of the peace we are enjoying in this festival and we believe that we will go beyond this festival. We believe that the Amnesty office will spread the narrative of the impact it has made and is still making beyond this festival like we are seeing today”, Prince Aganaba maintained. A statement signed and available to journalists in Port Harcourt, Rivers State by Mr. Wabiye Idoniboyeobu, media consultant to Brigadier General Paul Boroh said that in his principal’s public lecture titled “The Federal Government’s Amnesty Programme and Its Implications for the Niger Delta, Particularly the Youths, Gen. Boroh, who was represented by his senior reintegration officer, Mr. Jude Gbaboyor, noted that the Presidential Amnesty Programme (PAP) was designed under late President Umaru Yar’Adua’s adminstration to return peace to the then restive region, saying that the programme has succeeded in restoring peace and stability to the region through various reintegration programmes for the 30,000 former agitators in its roll, which include education, vocational training, professional training in aviation and maritime, automobile engineering, entrepreneurial training and tourism and hospitality. He disclosed that hundreds of beneficiaries across the nine oil-producing states are being trained to establish their own crop, poultry and fish farms. Giving a breakdown he explained that only recently, 100 delegates were given starter parks after undergoing a recertification programme in catering and fashion designing at the International Institute of Tourism and Hospitality, Yenagoa, 105 delegates were trained in agro-business at the Songhai Farms, Rivers State, 200 trained in fish farming at Perecastle Fish Farm, Patani, Delta State, adding that his agricultural revolution has brought hope to the youths in the region. He went further to say that, 100 delegates at Songhai Delta, 24 delegates at the Federal University Technology, Owerri, in addition to various ongoing empowerment refresher training programmes in Rivers, Delta, Bayelsa and Akwa Ibom states. “An average of 25 each have been trained in fish farming in six centres including the Delta State University by Gedisco Energy Solutions, Infinite Farms in Ozoro, Delta State, and Orus Resources Farm, Aluu, Rivers State. “At the Institute of Oceanography, University of Calabar, Cross River State, 96 were trained in fish farming. Ma-Atari Farms, Port Harcourt, trained another set in poultry farming. Ogbebor Leadership Institute, Ologbo, Edo State, trained beneficiaries in rubber processing, TSC Services trained 24 in general agri-business at the Edo State College of Education, Iguoriakhi, while Eunirusk Investment trained 18 in cassava, corn and oil palm processing at the Federal University of Technology, Akure, Ondo State. “48 beneficiaries were trained in crop farming at the Faculty of Agriculture, Imo State University (IMSU), another 25 had training in cassava cultivation, processing to baking flour and fabrication of processing machines at the Rivers State centre of the renowned International Institute for Tropical Agriculture (IITA), Ibadan, Oyo State, facilitated by Primevails Nigeria Limited”, he said. These training programmes in agriculture were designed as a full value chain - from farming, production, processing, packaging, marketing to agri-business management, with each farm, according to Gen. Boroh, requiring the services of at least four farmers, creating 4,000 farm workers in the region under this phase. “Currently, 200 delegates are undergoing automobile training at Innoson Kiara Academy, at Nnewi in Anambra state, apart from 120 delegates that were earlier trained at Innoson Kiara Academy last year. The Amnesty office recently launched the Presidential Amnesty-Sport for Peace to meaningfully engage talented ex-agitator. The list is endless” Gen. explained. Mr. Jude Gbaboyor, who also is a delegate that came out with First Class Honours in his university in Malaysia, cited himself as part of the success story of the Amnesty programme, hinting that secretary to former ex-agitator, popularly known as General Boyloaf, he spent four years in the creeks, but that after accepting amnesty, he had opportunity to travel abroad to do his first and second degrees and now owns a large fish farm in his village in Delta State, addition to being staff of the Amnesty office. Meanwhile, the Chief Whip of the Bayelsa State House of Assembly, Hon. Tonye Emmanual Isenna, representing Kolokuma/Opokuma Constituency 1 has applauded performance the Coordinator of the Presidential Amnesty Programme, Gen. Boroh (Rtd) saying that though he had reservations about the Amnesty Programme, he has seen notable changes in the programme. “I had my reservations before now, but under Gen. Paul Boroh, I have taken keen interest in the Amnesty programme. 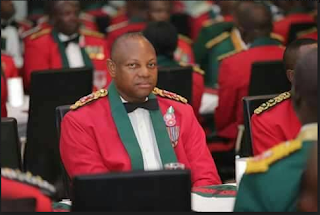 I must comment that Gen. Boroh is doing well. “I have seen the coordinator going round, supervising persons that have been trained and giving them starter packs”, the lawmaker reiterated. He however frowned at a situation where some beneficiaries of the programme sell their starter packs after they have been empowered, adding that “after you have been trained and given starter packs, you have to make a living out of it, but some people are selling their starter packs to buy other things to show they are big boys and after one month they are poor”. “You have to make use of what you have been given to fend for yourself. You don’t have to blame anybody, you have been given the necessary empowerment, and then why are you selling the starter packs”, he queried. Dignitaries at the public lecture included, Member representing Yenagoa/Kolokuma Federal Constituency in the House of Representatives, Hon. Doye Diri, Former Permanent Secretary, Dr. Godknows Igali, T O Ogoriba, President, Yenagoa Chamber of Commerce, Mines, Industry and Agriculture, Hon. Ndutimi Komonibo, Commissioner for Development, represented by the Director of Tourism, Head, Monitoring and Evaluation, Amnesty Office, Mr. Bestman Probel, Liaison Officer, Amnesty Office, Piriye Kiyaramo and Reintegration officer, Tarila Osi, among others.